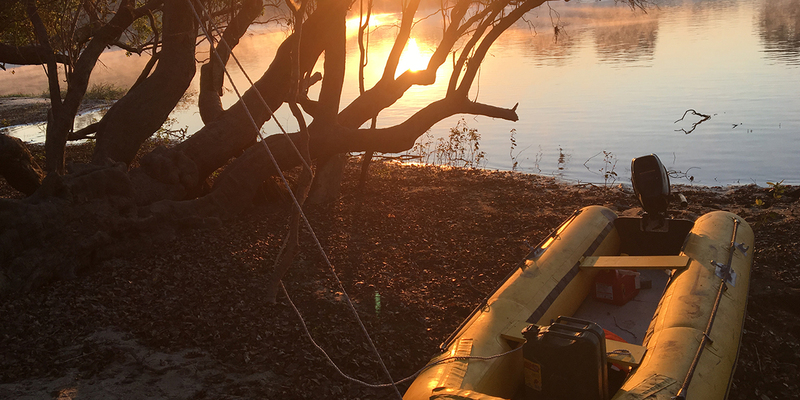 The sun was setting and, to add to the unsettling feeling of not having found camp, a croc the size of our inflatable boat leapt from the bank in front of us in a resplendent belly flop. "At times like these, I question why we're doing this," I heard Steve mutter as we motored away. And, while we were drawn to this stretch of river for being secluded - no lodge or office to save or stifle us - I understood the danger of being on the water as darkness fell. Yet, some inner voice shook the hindrance of fear, knowing this is what it is to love Africa and the outdoors beyond a superficial appreciation. I had dipped my paddle beyond the frontiers of courage into the Kafue River and she was explaining what it means to truly love and explore. A car filled with gear, past snow on the Drakensberg Mountains in the distance, we set off for Zambia. A man. A woman. A yellow inflatable boat. Steve had followed rivers in the past but, to me, this was a snaking line of water on a laptop screen and a dream - and, God knows, when it comes to building experiences worth talking about, Africa is the keeper of dreams. I had lived wonderful African adventures in the past, but this was a new territory, a new test of grit. Here, the threat would be greater than radioing for help if you broke down in a muddy field. Here, we would be testing our resilience in a setting which was wild, beautiful, and threatening in equal measure - and we would have to rely on each other for the best possible outcome. The road trip took us along the wildest strip of highway in the world in Botswana - one where, rather than billboards, elephants lined the roads and hornbills flew up in a blur of yellow, white, and black as if in procession as we passed. Life reset on the banks of the Chobe as elephants passed us in huge herds and lilac-breasted rollers rolled in lavender skies. I followed the man who follows rivers over the Zambezi into Zambia and wept in time to the fall of the Smoke that Thunders. The road to Kafue was dotted with famous names - monuments to why we explore - and no amount of fame took from their ability to stir. 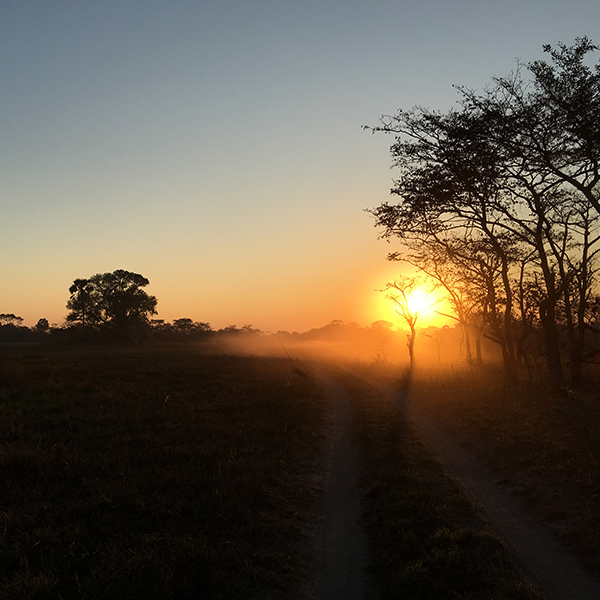 We drove into Kafue National Park in the late afternoon, chiaroscuro over golden forests and a window of dirt roads otherwise covered in water for months on end. We chased the sunset to get to Nanzhila Plains on time - along white sandy roads in dimming light - our first introduction to the Moorish haze of the plains we were to experience over the coming days - an African Wuthering Heights where Heathcliff roamed amongst the waterbuck in the setting sun and where a puff of dust in the sunset marked the presence of serval in the distance. watching shooting stars writing haikus in the sky. "Night in Africa. Travelling through bright star shine. Tomorrow's wishes." A traveller from Bordeaux told me she makes an annual pilgrimage to Africa for the sake of her soul. We shared shooting stars and dreams from the campfire that night and I can't say for certain, but the sparks from campfires in Africa certainly seem to be carriers of hopes in that part of the world. A few blissful days in Nanzhila later acclimatised us to the steady pace of this place. This was not to be the typical safari experience. The Kafue operates on her own time, but we felt an urgency to get on to the water. We pushed on to Musungwa and the banks of Lake Itezhi-Tezhi where we finally put our boat on the river for the first time. On high alert for crocs and hippos, we were finally on the water and the tempo changed. We went past the banks of pastoral African scenes - the remains of great palms standing like totems to the wild that was to come. As we sailed into the afternoon of mauve skies and idyllic river islands marked with nothing but sunscreen and peace, the realisation hit that there was no turning back. And that's precisely when the first hippo grunted and the river branched into the waterways we had come to explore. With senses on high-alert, the tenor of the trip altered from jaunt to adventure. The further we went, the more the river changed and one thing was clear - we were guests here. The river's main channel was a charming seductress bathed in sunlight with pods of hippos in the distance but, as the river narrowed and we looked for a place to set up camp, the smaller channels became dark, murky, ominous causeways. 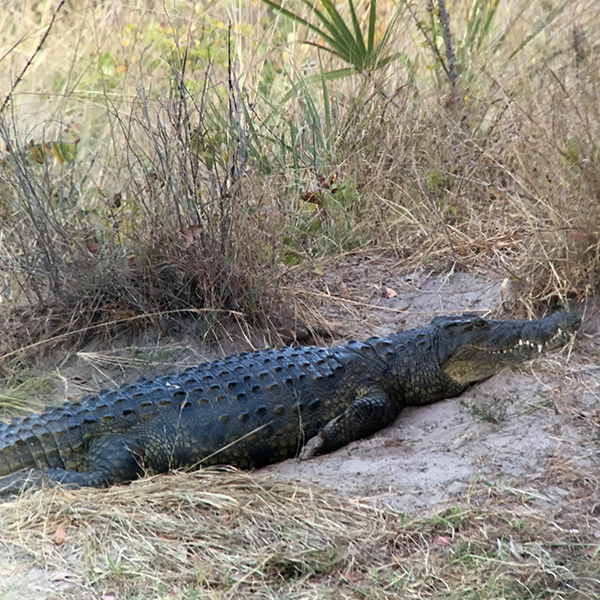 Crocs observed us from rapids and something inside me steeled. spot and a giant croc launched himself from the bank into the water in front of us, I felt the somewhat comic shift that comes when "never in your wildest dreams" suddenly lurks in the water next to you. The sun was low and setting up camp was a pressing concern we didn't speak out loud. An encounter with a lone hippo in some rapids confirmed it - we needed to get off the water. Eventually, we pulled up on a bank and pulled the boat up a game trail. Our Google mapping told us we were completely alone and so, when we heard the start of an outboard in the distance, our worries suddenly took on a very human form. "You can't stay here. Come with us." 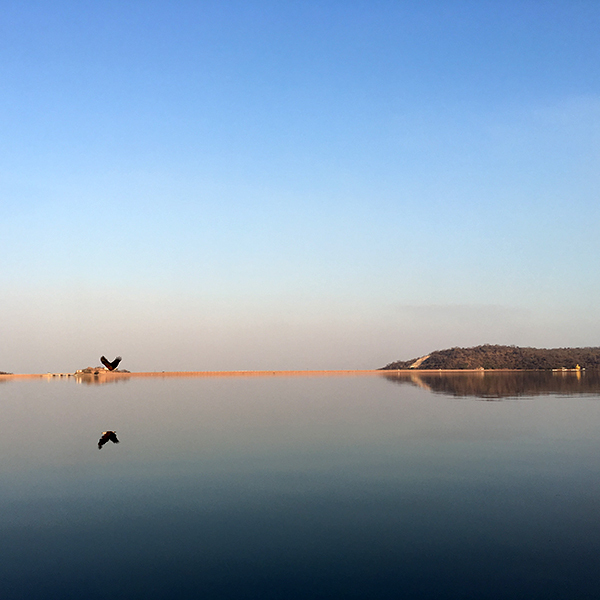 Not knowing what awaited us, we followed a tinny boat through the black and pink swirls of water to the chorus of hippos in the distance to a lodge. Standing, literally hat in hand, covered in mud and wildlife excrement on the banks of a hunting lodge, we begged a place for the night and got more than we ever could have expected. Hospitality in Africa is more than a luxury lodge on a riverbank. It is people who can look sympathetically upon a pair of river rats and listen to their story next to a fire for the night. 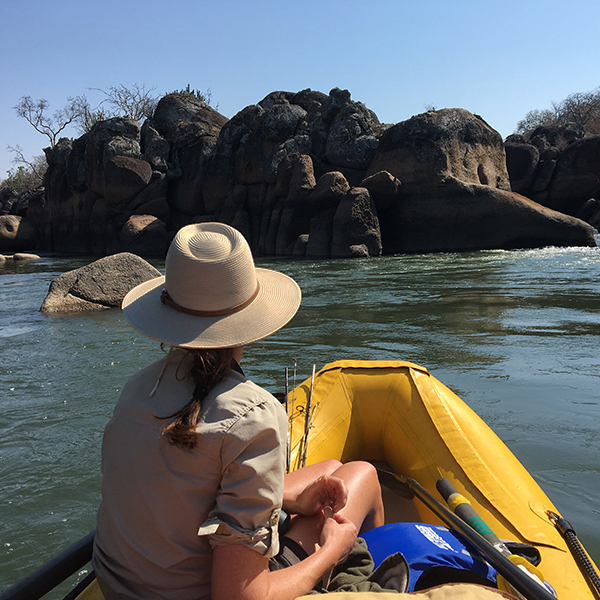 We ate and drank well that night with the generous hosts at Ntsonga Lodge who, enthused by our fireside tales, led us through the channels - through gorges of rock and benign islands - along the course we'd need to take during the rainy season. We went on to Kaingu and set up camp at Chief's Camp for a few nights. 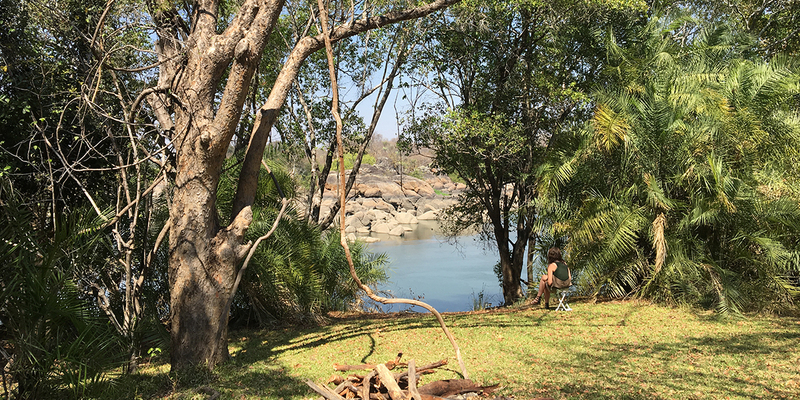 As I wrote my diary entry from a riverside hammock, a hippo watched nearby - flanked by rocks reminiscent of an African version of Thai islands. We went on a boat ride with one of the wonderful Kaingu guides and it was lovely to hand over river watch responsibility to someone else. On having our resident hippo charge us on the way back to camp, we were reminded there's no letting your guard down as we retreated to the bathroom area for safety. This adventure was far from over and Kaingu was the perfect next step in the story. Watching the sun set over distant baobabs, Steve told me this was a place we'd go back to when the trip was over. Indeed, that stopping point over the Kafue is the seat of many peaceful recollections in the mosaic of the trip. Zambia continued to reveal herself to us as the most unexpected hostess as we carried on our trip. 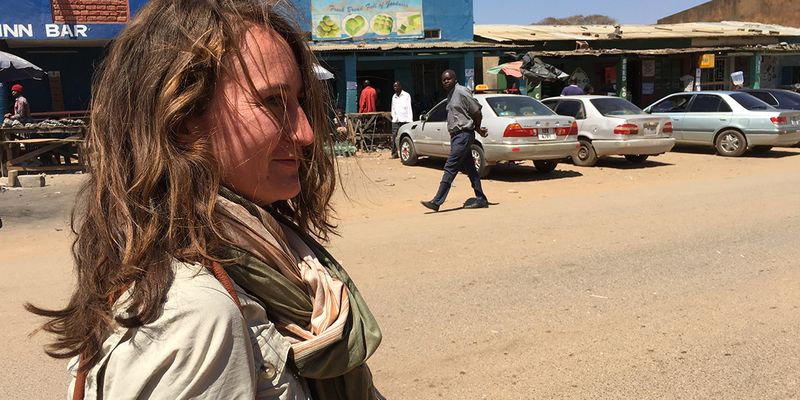 From shopping for essentials in the dusty town of Mumbwa to being taken in by a kind farmer after breaking down, every encounter we had was both fortuitous and a sign of the humanity engrained in every Zambian. Landing at Kafue River Lodge was an extension of this. Like two kids with their faces full of stolen candy, we had been spoilt. 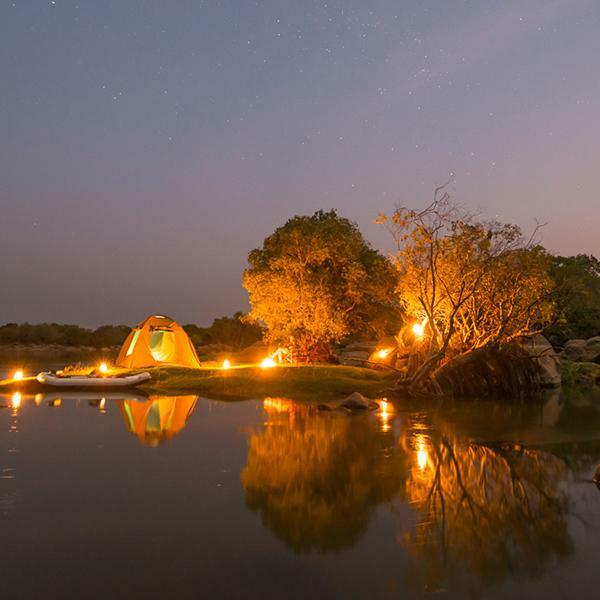 And then we happened upon Kafue River Lodge and, yet again, serendipity cast a magnifying glass over the wonders that lay along the banks of this special river. We met Idos at the delivering end of a river crossing and we followed him to a campsite next to the river, where hippos lay like great grunting rocks in front of us. That simple campsite, under a sausage tree, is the first thing I think of when I think of the Kafue. this stretch of river to the chagrin of pods of circumvented hippos like it was commonplace. 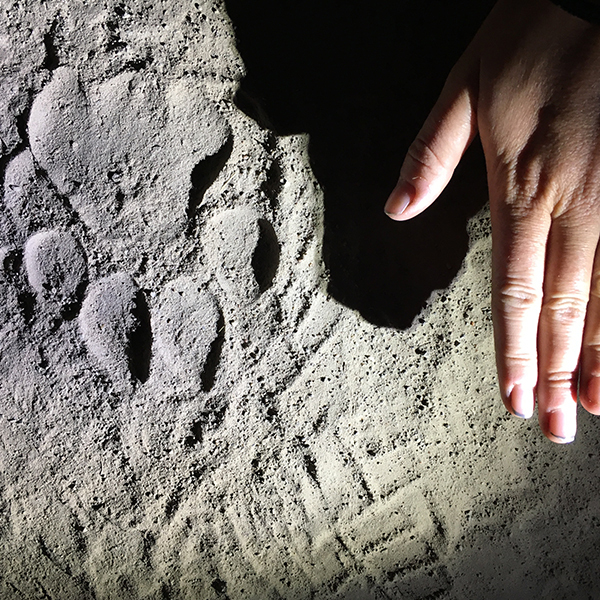 We walked through bush, brazen in our exploring as we placed our footprints next to the giant paws of predators in the sand. Our last night there, we listened to the sounds of two leopards courting across the islands and, in the early hours, we were woken by the sound of a lion next to the tent - a sound that made me wake to my own shivers before its source was realised. I've since followed the river to the north of Zambia. I've followed the man who follows rivers and become a river creature on my own. I have seen what happens on a Saturday morning in dusty roadside villages and compared it to the realms of my western experience. I have sat in the kitchens of extraordinary people who have settled in this place and made it home and, for a short time, called it home myself. I've since returned home and been reminded, through a set of personal circumstances, that the travails of life can test the bounds of courage and spirit. In the blackness of the early hours, the sum of these experiences is always punctuated by the sound of a lion who roars into the darkness and the reminder that the power of our experiences stands to transform everything. And there is nothing more extraordinary than having followed a beautiful African river and exploring the Kafue from the vantage point at the starboard of a yellow boat. Beached at sunset at Kafue River Lodge, the dragon's breath of the Kafue comes to life in the perfect afternoon light. A lair to dragons indeed, this was the perfect view to plot the stretch of river we would explore next from the safety of the camp. 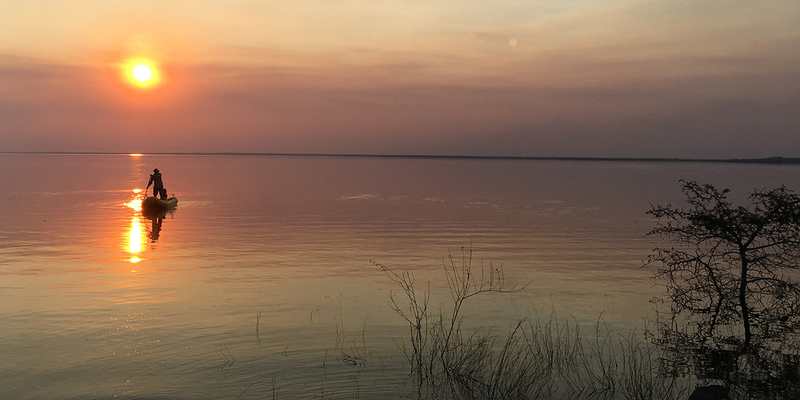 Back on Lake Itezhi-Tezhi after our thrilling first day and night on the river, the boat unloaded and the first leg of the adventure over, Zambia spilled paint over the sky - silent sunset fireworks in celebration. After the almost constant whir of the engine, the scene demanded enjoyment of the water until the last shred of daylight was done. A pot simmering over a fire on the waterside, it was time to SUP. From Kazangula to a number of different spots along the drive through the Kafue, the pontoons make for a river crossing of a different kind. The chug of the engine and the smiling faces of the drivers and pedestrians made for a wonderful intermission - both on the river and by road. Chief's Camp at Kaingu was a happy stopping point for a solid few days - and the perfect retreat for a writer-adventurer at work. Extract from my scribbles that day: "We are working at Kaingu. The commute to the lodge is a short walk through some bush and this is a walk I have made back and forth a few times today, stopping to listen to the local music like a gentle mantra from the nearby workshop. I dabbled in some work, but this gave way to watching a cormorant sunning itself on a rock, the potential to get some footage, and the temptation to get a G&T or a Fanta in the heat. More than anything, I find the river a constant distraction. The trip is ever-present in my mind and there's no avoiding the impulse to walk down to the water every time I see it in my peripheral view. I won't be here forever and that means we'll be leaving too soon." Stopping off in Mumbwa for some money and supplies, Steve and I agreed - give us a dusty town over a conventional shopping mall any day! As we went from shop to shop, every friendly store owner made us leave with big smiles on our faces over some anecdote or another and, after sleeping on thin camping mattresses for a good long while, Uncle Steve's mattress shop was like an mirage in the desert, beckoning us to enter. With shopfronts lined with local produce sellers, a tomato has never been fresher or more delicious. Parked at Ntsonga Lodge after the staff heard our engine and came to find us at the end of the first day on the river. In the dimming light, it was good to be off the water - especially after being told that lions frequented our original stopping point. It certainly was a test of wits as the day drew to a close. It was also a great test of gear. Looking back on our images, I am amazed by the amount of things we managed to squeeze on to that boat, a careful itinerary in my mind. From what we took to the boat itself, its captain, and its spotter, we were a high-performance team! Visiting the Kafue meant exploring the river, but also exploring this incredible park. 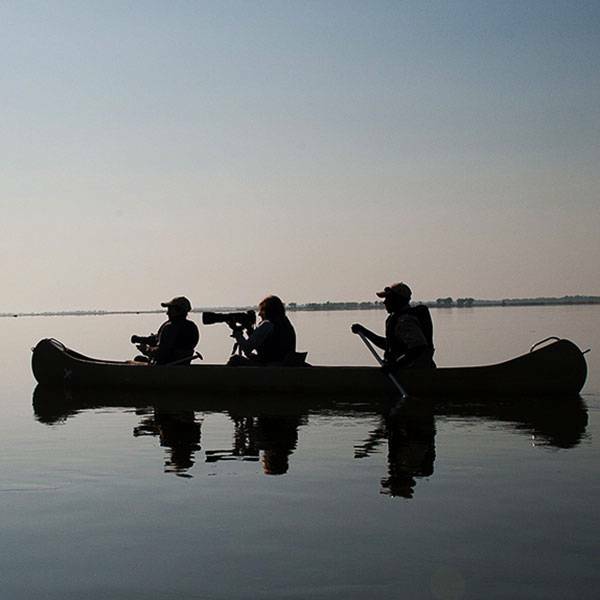 From the astonishing bird life to herds of Defassa Waterbuck watching with bearded curiosity and the bandit eyes of the roan, driving the dusty roads of the Kafue was unrushed and serene. We sweat, so that you don't have to. Expedition testing products is central to everything we do. We prefer to expedition test our products rather than hide behind large marketing campaigns which claim too much and deliver too little. This is the core reason for embarking on this expedition through the Kafue. The testing and re-testing and res-sampling is ongoing at The Safari Store. It is a part of our DNA. Where products do not meet the high standards we set for the clothing and gear you should be going on safari with, we either design, re-make, and re-test the products until we get them right, or we scrap them altogether. A good pair of binoculars are a safari essential and, as it turns out, an expedition essential too. 10x42 binoculars offer the kind of view you need on safari and, although I extensively used the Swarovski 10x42 binoculars on the boat, I tested the Vortex Crossfire 10x42 binoculars on game drives and could see what the hype was about - literally. Although there was a slight difference between the Vortex and Swarovskis, these binos made for good, clear game-viewing and they were my trusty companion in the park. The Mara&Meru™ All Day Casual Safari Shirt was also right at home in this setting and its cool, loose viscose fabric made for comfortable wearing that looked great out and about and back at the lodge. We took an ammo box full of RID and SafariSun™ on the recce and used every bottle. I love SafariSun™. It gives your skin a lovely glow and there's no sticky cream to deal with. With hot sun reflecting off the water, it was really put through its paces. I didn't suffer with one day of sunburn during this trip to Zambia and left with a wonderful tan and healthy-feeling skin. RID was a life-saver and, boy, did we get a chance to test it. There were many tsetse flies along the route and I saw everything from giant black and blue traps on the roadside to hanging cans of insect-repellent at the entrance to lodges and burning dung buckets on the back of game drive vehicles to deter them. They are relentless and I suffered with a few very painful bites - and have the scars months later to prove it. With regular application, RID worked incredibly well at warding off tsetses (except for a bite on the crown of my head where I hadn't sprayed) and, even where the air was black with swarming plagues of mosquitoes on swampy riverbanks, RID made me feel like I was untouchable. I didn't take malaria tablets, putting my full faith in RID, and I swear by its efficacy. For those who doubt it, it can get really cold in Africa - even when midday temperatures are pretty hot. I experienced this especially on early morning starts and game drives where we set off swaddled in blankets on the back of open game drive vehicles. I had the Rufiji™ Safari Gilet and Fleece with me and was thankful for them every day. Paired with a kikoy as a scarf, I was snug and warm - left to concentrate on scanning the bush for game. As the day heated up, I was thankful for my Mara&Meru™ Birdseye Safari Shorts. Always comfortable, they are just what you need for warm destinations and look just right on African adventures. Some of the essentials - the hat, the binoculars, the long-sleeved safari shirt. I was lucky enough to test out a couple of the new range of Mara&Meru™ hats on the recce trip and, although this white wide-brimmed hat is being rolled out in a safari-friendly colour, it was my favourite style and I wore it every day. Its wide brim offered great sun protection and I managed to fit it well using the internal string so it didn't blow off my head on game drives and on the boat. The Swarovski EL 10x42 binoculars are a safari-lover's dream - and an expedition tool. 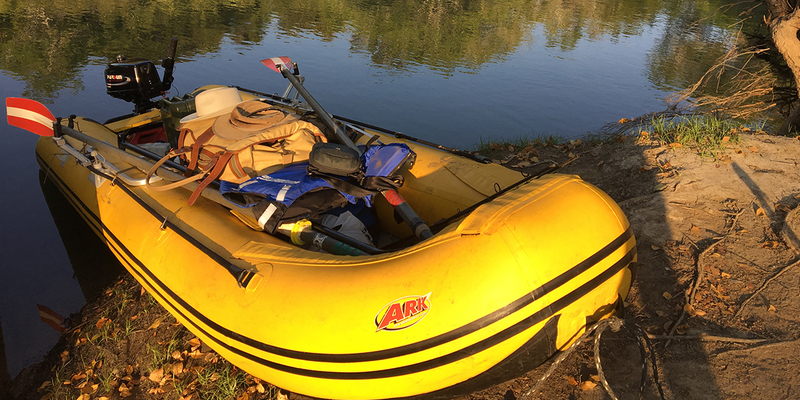 I used them frequently on the water to spot crocodiles and hippos in the distance (and took a moment to appreciate their beauty when I did - in crystal clear view). Their clarity is frankly astounding. You've never seen anything like it. I wore the Mara&Meru™ BUGTech™ Everything Shirt almost every day on the trip. In combination with RID, I had the assurance of extra protection from mosquitoes and insects and the built-in SPF really worked. I only applied SafariSun™ after rolling up my sleeves when I got too hot and didn't suffer with sunburn. It is light, comfortable, and breezy - just what you need for an adventure! The Mara&Meru™ Safari Voyager Suit Bag was the luggage of choice for this trip. Alas (or, rather, thankfully) no suits were worn in the making of this recce, but the suit compartment is perfect for shirts. Steve and I packed all of our clothing for a month of recce adventures into this bag. Given, this has quite a lot to do with the quick-drying BUGTech™ and MaraTech™ fabrics but also says something about the extraordinary space on offer by this soft and squashy hold-all. You probably wouldn't take your suit bag on a boat along a river or put it on the roof of your 4x4 through a national park, but you could if you wanted to. The Rufiji™ Safari Shirt Dress is everything a girl in the wild could hope for. From the moment I unwrapped it, I loved its styling and, in light MaraTech™ fabric, it has all the wicking, sun protective benefits one could hope for in an outdoor garment. In a smaller size, I wore it over shorts and leggings, with the belt and without, tucked into jeans - you name it. I have since got one in a larger size for an extra bit of added length to wear it as a dress a bit more comfortably. I love it so much I could wear it every day. Ever since the iPhone-only safari, the adapter for iPhone (for both binoculars and, recently, the digiscope) has made my phone my go-to camera of choice on safari. Attached to a tripod or monopod for extra stability, I am always impressed at the photographs I'm able to capture.